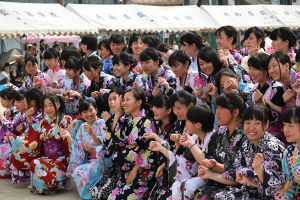 We are 25 seniors in the nursing program from Yamato Seiran High School in Fukuoka. We have planned our school trip to Hawaii with our vow to become a nurse in two years, and the enthusiasm to give an amazing performance at the Honolulu Festival. Changing from our school uniform to yukata, we will give a dance performance inspired by traditional Japanese femininity.